The country singer has dabbled in comedy before and staged his own stand-up shows, and now bosses at the streaming site have decided he's funny enough for a TV special. 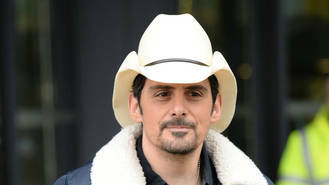 Brad Paisley’s Comedy Rodeo will debut on Netflix on 15 August (17). The marathon, three-hour special will feature fellow comedians Nate Bargatze, John Heffron, and Jon Reep, and special appearances from David Hasselhoff, who co-stars in Paisley’s Last Time for Everything video, and country music legend Reba McEntire. Brad and Hasselhoff announced the special in a video posted online over the weekend, during which the country star attempted to play the Knight Rider theme on his guitar as he and the actor sat on the bonnet of the cult TV series' all black motor, KIT. Hasselhoff starred in the 1980s show. The Celebrity hitmaker filmed the TV special during his Wild West Comedy Festival at Zanies Comedy Club in Nashville, Tennessee in April (17), which featured sets from Bobby Bones and Adam Sandler. Paisley's quick wit has been evident for years as the co-host of the CMA Awards - the country star has fronted the show with comedy sidekick Carrie Underwood for the past nine years, and the duo will return to host for a 10th time in November (17). It is not clear if Underwood will be part of Brad's Netflix special. Paisley recently released his 11th studio album, Love and War, and he'll be part of Macy’s 4th of July Fireworks Spectacular in America next month. Brad will join fellow country stars Craig Campbell and Lady Antebellum and singer/actress Hailee Steinfeld for the big show to mark American Independence Day in New York City.